One of my favorite parts of today was looking around and seeing people stand on any tall surface they could climb onto. Radar towers, warehouses, scissor lifts.. nothing was off limits for this once-in-a-lifetime experience. It’s not every day you can see an actual space shuttle take a ride on the back of a 747 with fighter jet escorts. 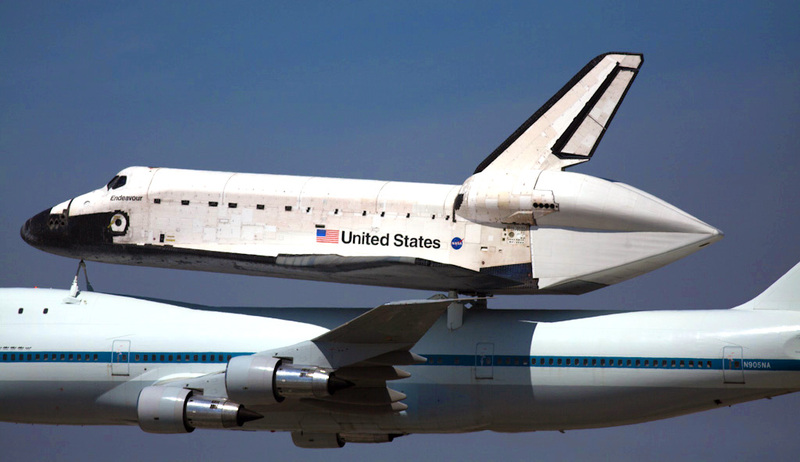 Best retirement trip ever – it’s good to be a space shuttle. I was at the LAX airfield, very close to the runway. I got there at 8a, and every single time a plane came close to a landing, we couldn’t help but think “omgomgomg is that it? !” Fog in SF delayed the shuttle, but that gave some of the marina haze in LA a chance to burn off a bit. Endeavour flew by three times before landing. I can’t really describe the landing, except completely exhilarating and surreal. It’s gigantic. And loud. We heard the noise from the plane after it touched the ground. It’s being towed by an SUV in October from LAX to it’s new home at the California Science Center, and I look forward to seeing it one last time. Check out Eliot’s Endeavour writeup, too!